There is violent upheaval in Alabama right now. Let's play the FEUD! The violence began on Sunday night when a fight fueled by the families' bad blood erupted after a basketball game, and at least one shot was fired. By the way, a true hero of White Trashdom has moved on to the Great Moonpie and RC Cola party in the hereafter. 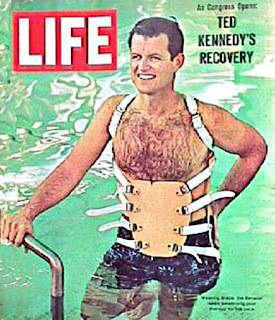 Bow your head for the passing of Hall of Famer, White Trash Teddy Kennedy. Here is the White Trash eulogy by another Soon-to-Be HOF White Trasher. You know it is good when they have to call the State Police. What is that thing Ted is wearing? He "allegedly" hurt his back when he killed Mary Jo Kopechne back in 1969, (D)T5. That was how he did not have to stand trial for murder. Well, that and the fact that he bribed everyone in the United States to keep from getting the electric chair. In case you are unaware, the Kennedys are/were scum. Two Dogs, I am ready to play the "Family Feud." Merciful heaven! There ain't nothin' like a good Sawyer/Moore b-ball game shootin' to get everybody's blood boiling! I have been spoiling for a "real" 'bama controversy for months. And to find out that a "law office employee," one Debi Foster "witnessed the scene from behind closed doors,"...well, I got a two-fer. And then to find out that "There's still a broken mop in the driveway"...Well...I am in a state of U-foria! I notice that this article is from Singapore. I'm hoping that nothin' got lost in the translation from chink to white trash. Because it all makes perfect since to mee. You da man! My itch for a good ol' golf club, brick, stick, gun, and broken mop smack down has been scratched. So feudin' ain't just for Kentucky folks anymore? Almost sounds like some moonbat decided "gang war" is not politically correct anymore. Heaven forbid anyone in the press just come right out and say, "this stupid sh*t by a bunch of stupid people just happened." Is Richard Dawson moderating Bama Feud? I was once taught that if I didn't have anything nice to say about someone, I shouldn't say anything. I've since outgrowd that, but I won't abuse a corpse. Nor will I bemoan the fact he is now a corpse. Was that respectful, in a non-respectful way? The drunken Teddy ran out on an innocent woman who was left to DROWN, people. DROWN. NO AIR. GASPING FOR AIR. But IT'S OK CAUSE HE'S A (DRUNKEN) KENNEDY!!! HE PANICKED! SO IT'S OK, OK? A guy that did the same thing around the same time was sent to prison for years on a manslaughter charge. But that was DIFFERENT. (Cause his name was Smith or Jones or Washington, anything but Kennedy) The hypocrisy of the Left is indeed wondrous to behold. But THEY CARE. SO THAT MAKES IT OK.